Kazunari Abe was born in Ehime and raised in Tokyo, Japan. During his studies at Hokkaido University, Kazunari became captivated by Japanese folk arts. When he saw the renowned taiko performing arts ensemble "Kodo," he decided to join the group. He went on to perform internationally with the ensemble for fourteen years.Now a solo artist, Kazunari is based in his birthplace, Niihama City in Ehime. 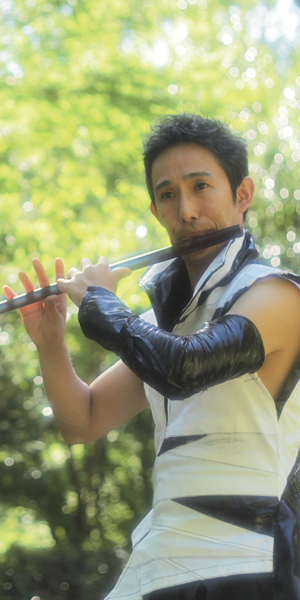 Kazunari focuses his creative work on the shinobue, a traditional Japanese transverse bamboo flute, which he uses to depict the energy of the heavens, earth,and people. He has performed in thirty countries to date and collaborated with a wide range of artists in Japan and abroad, such as Belgian choreographer Sidi Larbi Cherkaoui and master of the Kanze School of Noh, Reijiro Tsumura. In 2014, Kazunari released his first solo album, "Ryu no Koe –The Echo of Dragon Singing," featuring original compositions inspired by his frequent travels between home and abroad. In the fall of 2016, Kazunari took part in the world premiere of "ICON," an innovative production by Sweden's Göteborg Opera Dance Company.